By eck! This is a big 'un! 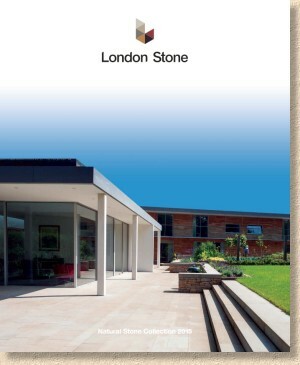 The new 2015 brochure from London Stone is a significant and weighty document, and a huge step up for the company. Not that previous editions have been lightweight or insignificant, just that this new publication is in a whole new league. With this, London Stone are taking on established premier league names in terms of presentation and intention. Right from the outset this looks promising. A large format 230x280mm full-colour production, with heavy card cover and semi-gloss quality paper inside. The cover itself makes a statement: clean and simple design with a full-sized wow photie, basic logo placed top and centre, and an understated title in barely legible white text at the bottom. This, alone, makes a statement of intent, and triggers the question of whether the content can fulfil the promise made by the cover. There are a generous 20 pages of introduction to start off with, but 220 pages to play with, it's not excessive, and besides, much of it is worth reading. More than that, this lead-in heralds a trend that becomes apparent throughout the brochure: lavish endorsement and not a little trumpet-blowing from well-respected designers. Clever move, because as you thumb through page after well-laid-out page of sumptuous photography and concise explanatory text, it becomes apparent that the target audience for London Stone is very much the high-end garden designers, the discerning landscape architect and the better than average contractors. That's not to say that the brochure isn't suitable for clients, DIYers and homeowners: far from it. However, the photography has been chosen to showcase the stone (and it is almost exclusively stone) and its potential rather than sell an aspiration or a lifestyle fantasy. Further, there is no "How To,,,,", which is a good thing because the role of London Stone really is to source and supply the stone, not preach about how it should be installed, and so the emphasis is on the product, not on providing a full page-to-patio supply-and-lay package. Anyway, on with the content. It would take a document almost as large as the actual brochure to do justice to the breadth of the range. Suffice to say that, if it's stone for paving, it will probably be in here somewhere. There are also steps, copings and pier caps, but, with the exception of a cladding system, nothing for walling, which seems too obvious an omission to be a simple oversight. All of the currently popular stone types are represented: sandstone, limestone, granite, travertine, slate and basalt all make an appearance, and often in several formats. I love the fact that they refer to setts as "setts" and not the misnomer 'cobbles'. Definite bonus points for that! And more bonus points for largely avoiding senseless marketing names for the types of stone. 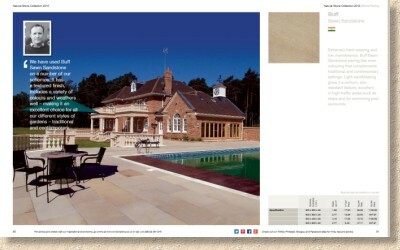 Beige Sandstone is a beige sandstone; Pink Granite is, as you'd hope, a pink granite. Blue Black Riven Slate is indeed a blue-black riven slate! So simple, so straightforward, so uncomplicated….it's a wonder that no one thought of it before! Buff Sawn Sandstone Generally speaking, the stone is of a high quality, and, as is now more-or-less mandatory, is ethically sourced. There is the odd bit of 'handle-with-care' stuff, such as the travertine (still not convinced it's suitable for the damp British climate) and the Mint sandstone, but this is not the fault of London Stone. You can't dictate what the Great British Public will buy for their gardens….just look at some of the god-awful comedy statuettes that disfigure and despoil the back gardens of far too many homes of what, otherwise, might be regarded as perfectly sensible people! The origin of the stone is revealed by using the national flag of the source country. While not everyone will recognise the official duster of, say, Turkey or Portugal, you'd hope they'd be able to spot that it definitely isn't British, except for the stone that actually *is* British, which has its very own section as well as ample use of the Union flag. There is definitely more of an appetite for native stone over the last two or three years. Maybe it's because people are feeling more affluent, or maybe it's down to patriotism, or possibly just that it's damned fine stone. Whatever the reason, the resurgence of interest is very welcome, and London Stone have selected a worthy if not fully comprehensive selection. Three sawn "yorkstones" which more or less cover the popular tastes of buff, brown and grey-blue, along with a Pennant stone, a Portland limestone. There's also new riven Yorkstone in a darker buff, and a 'reclaimed yorkstone' offering which really isn't done any favours by the accompanying photie. Where London Stone really excel is in their range of off-the-shelf steps and copings, which is then supplemented by a bespoke cutting service for non-standard installations. It's a stunning selection of sawn and riven step treads that will surely suit most tastes, and all this is backed up with the ability to have specific forms cut from stone to suit the rest of the paving on a project, and all done here in Britain, so lead time is measured in days rather months! Bespoke streetmasonry This is probably the most important difference between London Stone and other stone distributors serving the residential market. 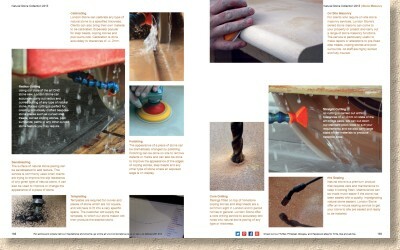 Whereas most of their competitors keep prices down by offering an off-the-shelf selection, often in Project Packs that best suit the needs of the supply chain rather than the end-user, London Stone attract a lot of custom because of their willingness to take on custom orders, to cut bespoke pieces, to provide precisely what it is the client wants. This earns them enormous respect from the designers and contractors who value the capability to offer their clients just what was required, not some 'one-size-fits-all' solution crowbarred in to minimise alleged hassle. This a great way to engender loyalty from your repeat customers. 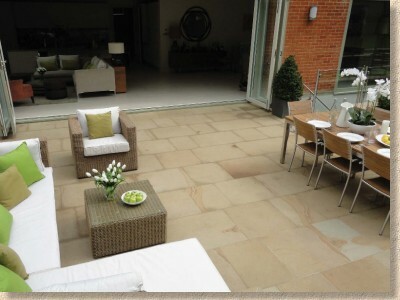 The one non-stone offer is a range of porcelain paving sourced in Italy, which, if you are going to source porcelain paving, is probably the best place to start looking. However, I'm not sure why a company with a reputation for stone should want to chance its arm with the unknown quantity that is porcelain/ceramic paving on the British market. Still, what they've chosen is a very good selection of colours and textures, and, most importantly, they have more than one size! Whether porcelain ever does grab a significant slice of the British market is still to be seen, but what London Stone have put out there this year can only improve ceramics' chances of success. 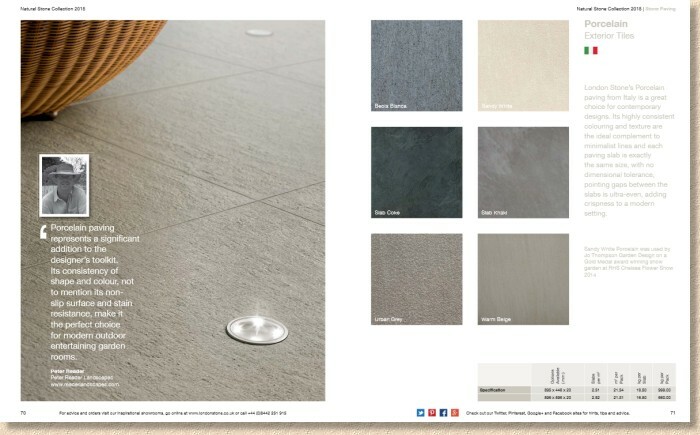 So, the stone is good, and the range is very good, both in type of stone and available formats, but what about the brochure itself? How does it come across? The short answer is that it does not disappoint. The whole thing breathes quality and there's a real air of confidence and reassurance. The photography is generally excellent without ever being over the top. In many cases, photies have been supplied by designer clients and installers (all duly credited), and are backed-up with short eulogies from the impressed client, which all adds to the general sense of reliability. 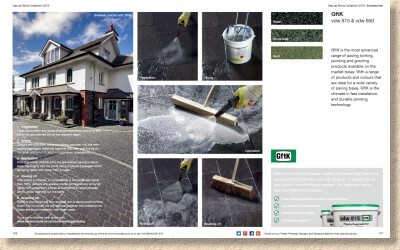 Typical page layout Swatches are large, but as is ever the case with natural stone, can only ever give a vague, general impression, so most of the imagery comprises site shots which can better show off variation in colour, texture and size. Sizing information is stripped down to the absolute bare essentials: plan sizes and thicknesses, pieces per square metre, metreage per pack, and slab weight, all of which is presented in very simple table format which even an apprentice could follow. 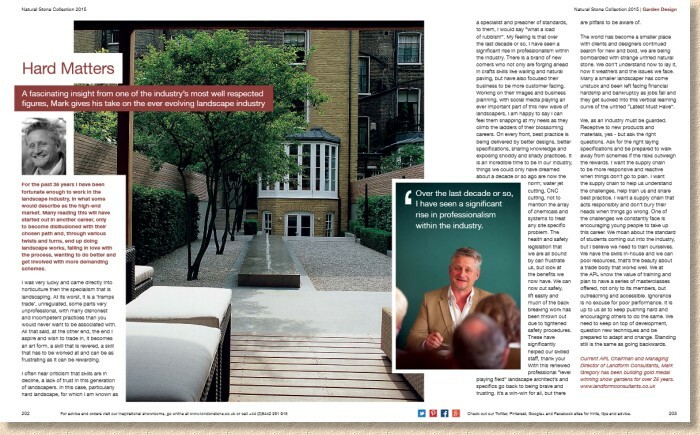 What does really set this brochure apart from many others, and it's an idea you can expect to see copied by several of London Stone's competitors in the coming months, is the inclusion of 'opinion pieces' from a number of well-known names on the design side of the hard-landscaping trade. Each contributor takes a slightly different tack in discussing a particular aspect of their trade, whether it's the thinking behind a particular design or the impact of British gardens on the wider world. 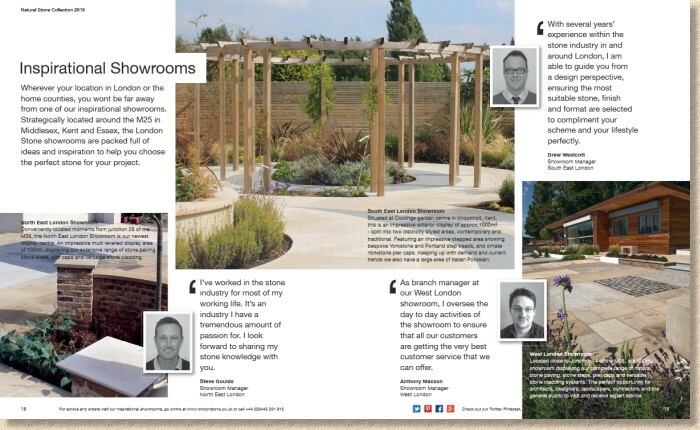 Maybe this doesn't sell stone; maybe it really is nothing more than getting 'names' to validate the brand, but without exception, every piece is worth reading, whatever your role in the trade. It's a delicious coda to the whole brochure, a bit of entertaining and informative dessert at the end of the main course. Yet another brilliantly simple but eminently effective addition to the whole. So, thinking back to the promise suggested by that cover: does it really deliver? Oh yes, it certainly does, and then some! 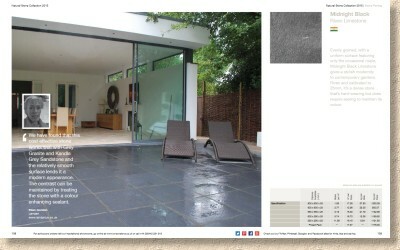 It is, without doubt, one of the three most comprehensive brochures of stone paving for residential projects I've ever seen, from anywhere in the world. It cleverly yet effortlessly straddles that difficult grey area between client, designer and contractor, with enough for each to feel satisfied without ever becoming bored. It's sufficiently sumptuous to earn a place on a coffee table or in a reception area, yet useful enough to find a place on the dashboard of a white van. There are several national, nay international, brands that would be proud to put their name to such a brochure. Bear in mind that London Stone are not part of a multinational organisation with generous marketing budgets. Most of what they do is done in-house by the same tight team of family members and a dedicated workforce. Of the dozens of brochures I've looked at over the last six months, this is, without any doubt, the most impressive given the size of the company. Seriously: well done London Stone!